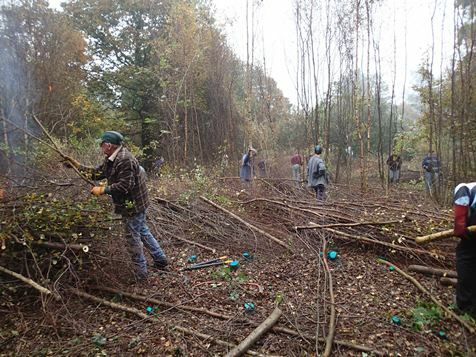 It was a dank day but a large team turned up to Wigpool where we created a new glade by removing the dense birch jungle! We were working quite closely together as the trees were packed tight and there were quite a few calls of 'timber' when the birch came down! However, we are an experienced team for this so no one got hurt. We left the few oak and rowan trees amongst the birch and hope that they will now thrive. 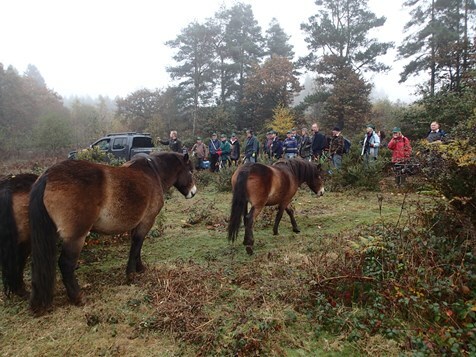 On our arrival, the three Exmoor ponies came to see us. They have been at Wigpool since the spring and are looking extremely healthy. Clearing is taking place and the blue tree stumps have been sprayed with an effective herbicide to prevent re-growth of the birch. 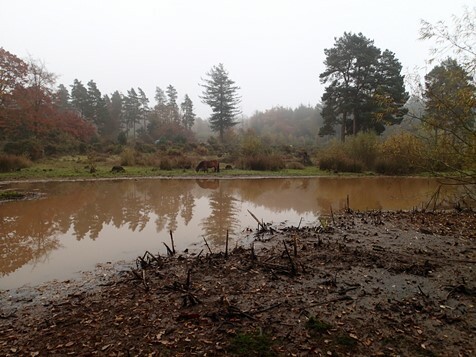 This is a view across the lake with one of the Exmoor ponies on the far side. The lake water level is quite low and looking muddy for this time of year but the rainfall this autumn has been lower than is usual.